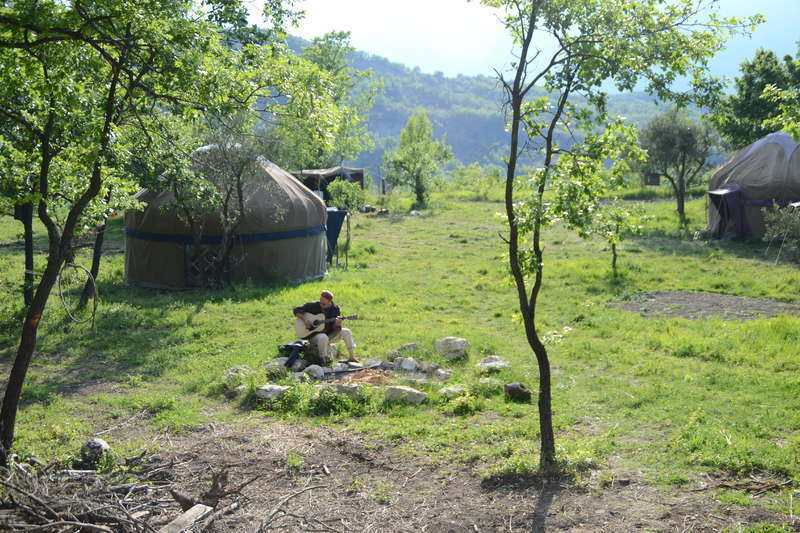 Join our project on a yurt campsite/events centre in the wilds of Abruzzo, Central Italy. 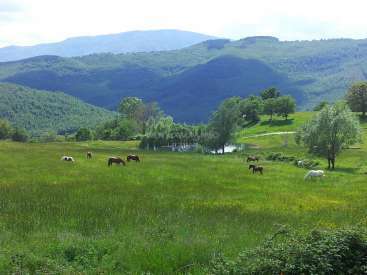 We have a 12 hectare site in Abruzzo, Central Italy on the doorstep of the magnificent Majella Mountain. On the site, we are developing a campsite/events centre of nomadic tents (mainly yurts), renovating an old Italian house, recultivating abandoned orchards and olive fields, growing organic food and...endless projects! 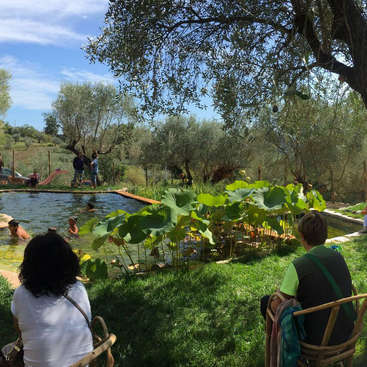 The wider project is working to regenerate and repopulate the abandoned lands around the local village: helping local farmers diversify and grow biological food, maintaining olive fields which have been left, implementing sustainable tourism projects e.g. 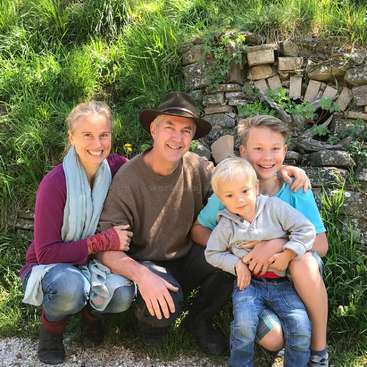 clearing the old walking paths for hikers, creating green campsites, preserving the ancient buildings of the area, and enabling the old ways of living and agriculture to not disappear. Living in wild nature in a small tribe with the communication and interpersonal skills needed. 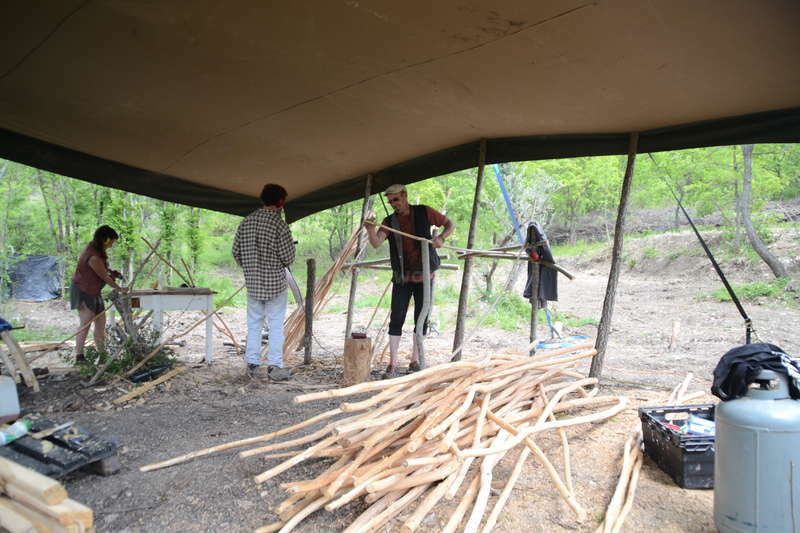 Learning skills in all the mentioned activities : yurt making, land cultivation, permaculture, organic food production (including olive oil), rural house rennovation. Sustainable local development. Some Italian language practice (although we mainly speak English), learning about Italian rural mountain life, history and traditions. 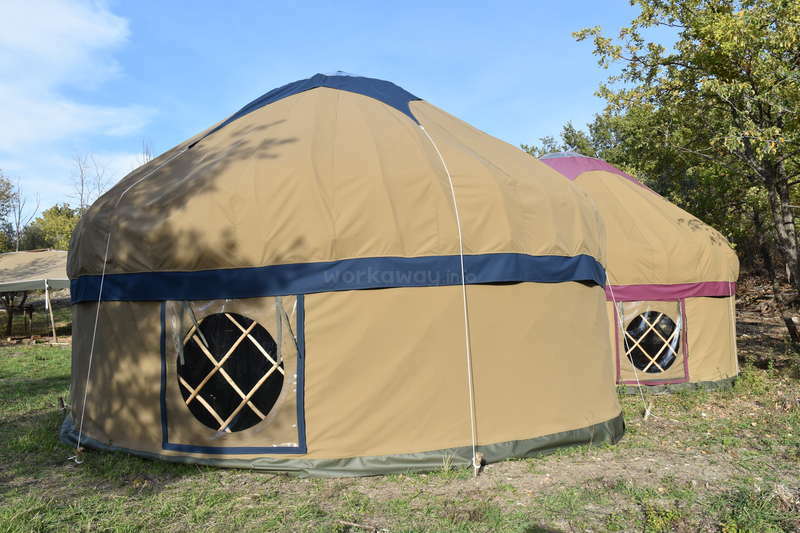 Yurts (canvas nomadic tents) with mattresses and pillows (you will need to bring your own sleeping bag). You may have to share the yurt if there are others coming to work. There is a communal kitchen tent for cooking: food is organic, vegetarian and delicious. Bathing is in a wood-fired bath, a hot bucket wash or jumping in pool or river. We are 2 people in the core with other people at various times. Our place is isolated so be ready for silence, nature and being alone sometimes. (If this seems too intense, it can be good to come with a friend!) We live quietly and simply, no alcohol or drugs or non-bio toiletries. No tobacco also, if possible. We expect people to be respectful of this amazing land and each other, and to take responsibility for themselves and their work, as a part of the whole. This is not a place for just doing a job and getting paid with food and accommodation but a project which we are all creating together. If we get along working together, there are possibilities to stay for an extended time. From time to time we have a sweat lodge ceremony which we prepare and go through as a group. There are buses from the local village, Torricella Peligna, 2km away, from Lanciano and Pescara. The local area has many medieval hilltop villages, museum of Roman excavations with a complete amphitheatre, many churches and ancient springs and the beach is only 20 minutes. Tea break during well digging. Malwa is a very special person, she lives in a dream world of sorts very quiet and dedicated, she stole our hearts, dont hesitate to host her!. Adela and Radek were an amazing couple that held our whole team together, they worked never complaining, although in truth there was a lot to complain about at times, their dedication and spirit left us with a feeling of family, they helped us through a challenging time and in a way held our workers instead of us. hope you get a chance to have… read more them hosted. An experience you just cannot describe with words. We spent almost a month in the place, and it was so difficult to leave it. This place is so strong and so amazing that it catches you and doesn't want to let you go. You don't get things like electricity or running water; instead you get much better stuff – interesting work, amazing mountains,… read more peaceful nights, outdoor baths under the sky… Be prepared for everything and you will enjoy it so hard :). Thank you, Nitsan and Lucy, for what you are creating down there. See you soon! Mine was a brief experience, only 5 days: wow! This is a project that really comes from the heart. I received what I needed: no distractions, beautiful people to share food, fire and work and a breathtaking nature. Thanks to everyone, guests and volunteers: Malwa, Radek, Adela, Jenni, Lucy, Annie and Nitsan. La mia è stata una breve esperienza,… read more solo 5 giorni: ma wow! è un progetto che viene davvero dal cuore. Ho ricevuto tutto ciò di cui avevo bisogno: niente distrazioni, bellissime persone con cui dividere cibo, fuoco e lavoro, una natura che ti toglie il fiato. Grazie di cuore a tutti, ospiti e volontari: Malwa, Radek, Adela, Jenni, Lucy, Annie e Nitsan. Joana is a true delight - very easy going and adaptable to new situations. and Alex is a gem, I wouldnt recommend her to anyone because… read more I hope she will always come here. Just joking, you can go wrong hosting this girl. Hi there Nitsan and Lucy!! 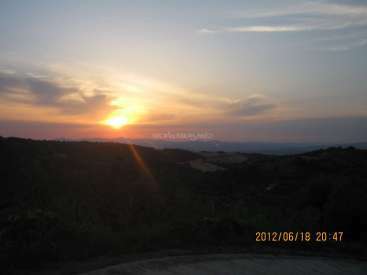 I miss this place like crazy and ralised that I havent written a feedback yet. Probably because it is not over for me yet. Your workaway experience was more than amazing. The physical work was very satisfying and I miss it a lot. The talks still move me every day and make me get in touch with myself. In some way this… read more experience healed me, in some way it made me feel understood and in some it makes me hungry for more. It felt really good to be so close to nature and people. Good responsible worker, I would recomand him to anyone. she is funny and loves food, so get her in the kitchen!! and she felt like family before she even arrived. Super team, very nice couple who quietly does more than expected. Ringraziamo Nitsan per averci ospitato lui è una persona molto disponibile e si interessa per il benessere dei volontari. Inoltre è un ottimo cuoco e sa fare moltissime cose, e noi abbiamo da imparare da lui. Durante la nostra permanenza c'erano tanti ragazzi li, eravamo quasi 10 condividendo ogni momento della giornata si è creata una piccola… read more famiglia è stato molto divertente. Eravamo isolati dal mondo esterno senza inquinamento acustico e luminoso e abbiamo avuto molto tempo per pensare in pace. Nitsan ha in mente molti progetti belli di ecoturismo per la sua terra noi abbiamo partecipato a uno di questi. Gli auguriamo che realizza ciò che ha in mente perché crediamo sempre nello sviluppo di altre realtà naturali e non convenzionali. Grazie di tutto un abbraccio Fra e Laura. work hard play hard party hard, those guys are really funny and amazing to have around. Those guys were the stars in our sky, they are funny and dedicated, and you really can't do better than hosting those two!. Only stayed for a week at Lucys and Nitsans place but it was a great experience. Before coming to their site I was staying at another place where I didn't feel good, here I was accepted and welcomed warmly. 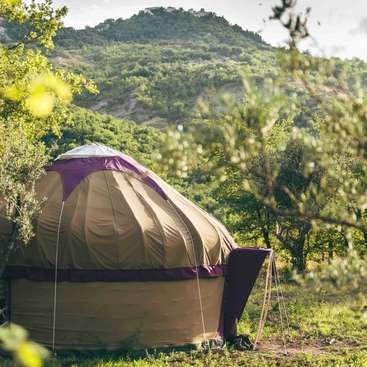 During my time their I had a yurt for myself which gives you alot of space. 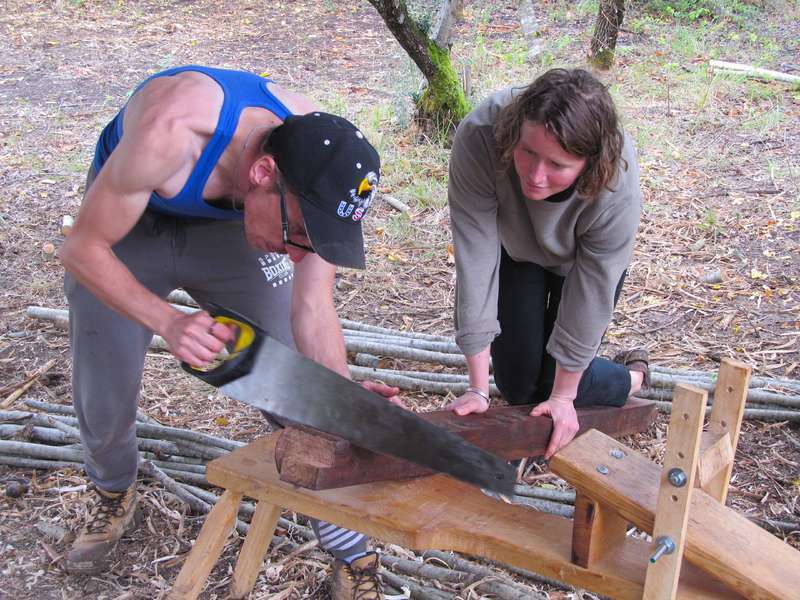 The work varied between shaping the parts for the yurts and land… read more clearing. Food was prepared outside kitchen with organic ingredients and very tasty. Definitely recommend to go their if you have the chance! It's difficult to leave a workaway reference for such a unique experience. I can only recommend to go here with an open mind and open heart, and great things can happen. Lovely girl, we passed so much together its hard to see her as a volunteer. Nice Guy, looked after the volunteer girls Like a champion, open and caring, and very attentive to details, if he asks you to be hosted say yes, because I know someone is going to grab this one for good. Young but very inquisitive person, some of the way we do things took a little while for her to grasp, but once she did she was a star, very hard working and always smiley and positive, and when things came up was very open about working things out, which is essential for good workning experience. Being in this beautiful space was a great and intense experience for me. I learned a lot about myself and the way Nitsan and Lucy live, and can take a lot of the things to my life. The work was various, we peeled, sanded and oiled the poles for the yurts, cleared the land, and fixed an old stone wall with plaster. We also continued building a… read more wall around the field, and also worked on the field. I enjoyed being a part of the project and see the inner and outer change in everything and everyone. We also did a sweatlodge, wich was an amazing experience I'm glad I could be part of. 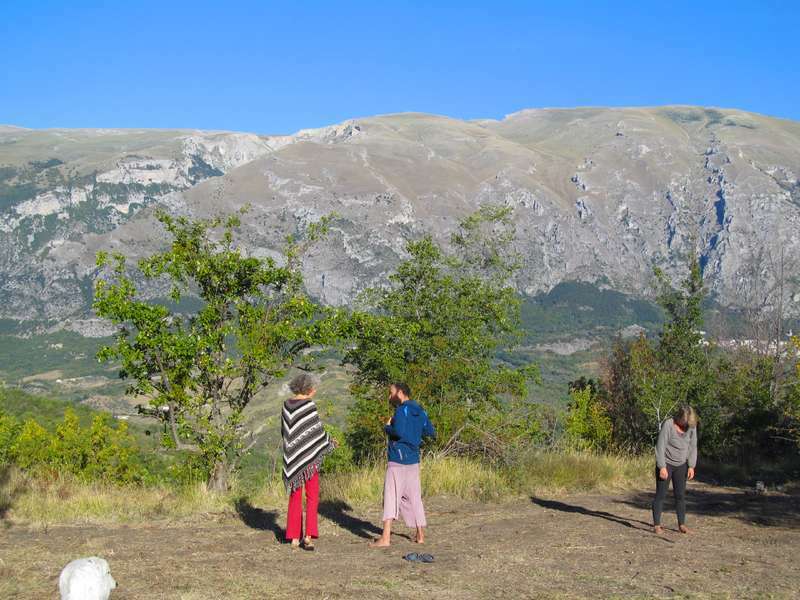 We had nice firesides, yurt dinners, mud baths, enriching talking circles and a big journey up the majella mountain. Thanks a lot to everyone, Nitsan, Lucy, Angela, and the workawayers, who took part of the process! Greets to the wild ( pioneer Kibbutz). I earned a lot. Thanks to Nitsan and Lucy for the good time here. Living in the wilderness and sleeping in a yurt for two weeks has been such a great expirience. The work (mostly building a fence around a field and clearing the forest) was good as you could see it changeing and it made me feel a little bit like a pioneer. 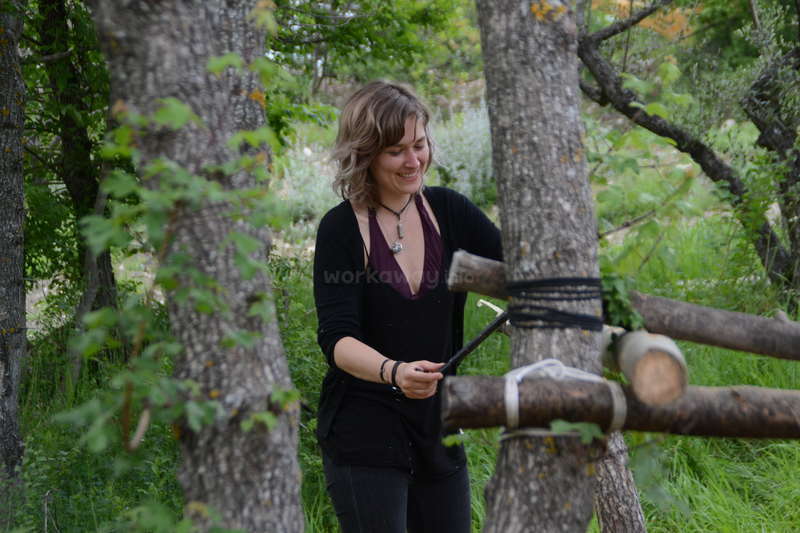 I did also parts of yurt making (peeling… read more poles, cutting fabric) and learnt how to build the yurt up and take it back down. You can do a lot of exploring around in the wild and visit the small, pretty villages. I had an amazing experience here. That said, I would recommend only coming with an open mind and thick skin. It is definitely a very wild and remote experience, including sharing the yurt with mice. I'll miss living in the wild, the conversations, AMAZING/nurturing food (seriously so good!! ), Israeli coffee breaks, river dips, and the starry… read more night sky. 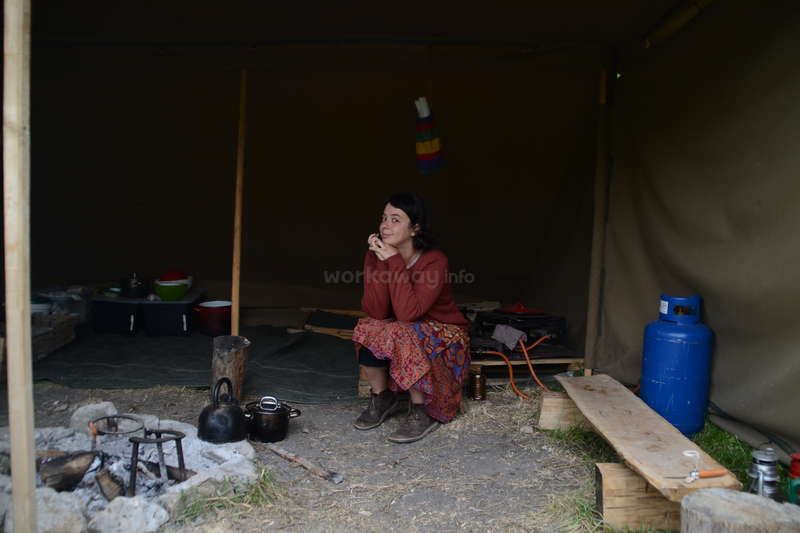 The work was no more than 4-hours/day and was varied including: clearing overgrown forest land, carrying and stacking firewood, and pilling wood to make yurt poles. Thanks to Nitsan, Lucy, and friends (like Angela) for the lessons, stories (thanks for putting up with all my questions! ), and hospitality. I learned a lot (not only related to the the work and yurts but also about travels, dreams, and life in general) and loved reconnecting with nature. Note that it would be very difficult to leave once you are there, as it's only reachable by a 30 minute 4-wheel drive to the nearest remote town. 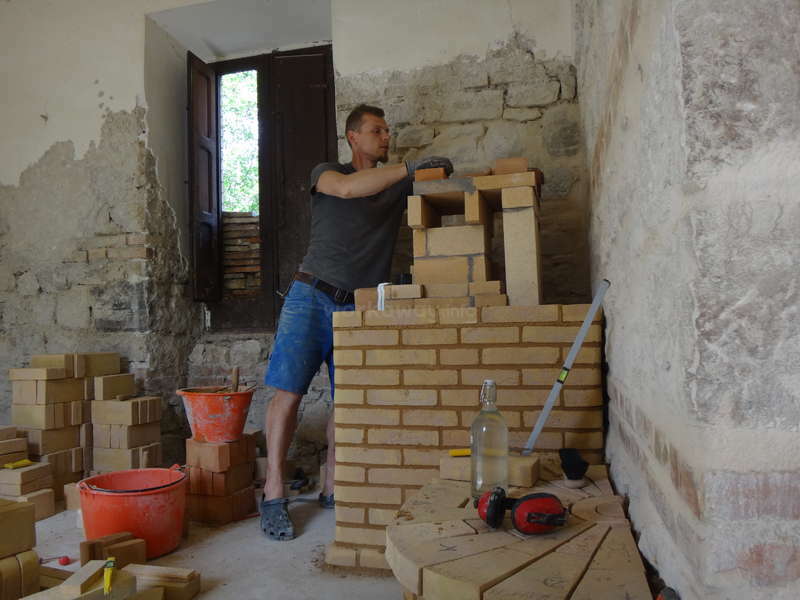 Volunteer with a young couple in Tuscany. 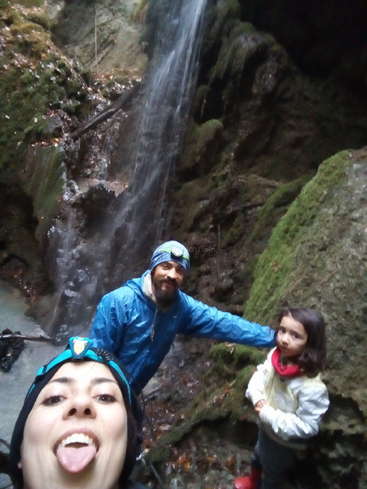 We're an Italian family who live in a small, interesting town in middle-center Italy, Faenza.